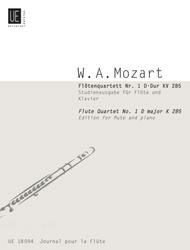 Flute Quartet 1 in D, Flute/Pi composed by Wolfgang Amadeus Mozart (1756-1791). Standard notation. Published by Universal Edition (PR.UE018094).With Standard notation.